Strawberry Sauce Salmon Recipe. Delicious meld of strawberries & salmon inspired by Rocky Mountain chefs. This quick, easy recipe is low calorie & so good! DIRECTIONS - if not already cut, cut salmon filets. Into 4 equal pieces. About 4 ounces each. Gently heat oil in large frying pan. Over medium-low heat. Add salmon filets to pan. Cook salmon for 10 minutes. Add dry white wine. Reduce heat. Cover. Simmer until salmon is cooked through or poached. About 10 minutes more. In the meantime, wash strawberries if using fresh berries. Remove stems and slice. Or use frozen strawberries, thawed. Mash two-thirds of the berries. A potato masher works well. Add fresh squeezed lemon juice. Cook over low heat until. Simmer until thickened. For thicker sauce, sprinkle in Agar Agar flakes before cooking. After sauce is thick, stir in remaining sliced strawberries. Mix well. Remove from heat. 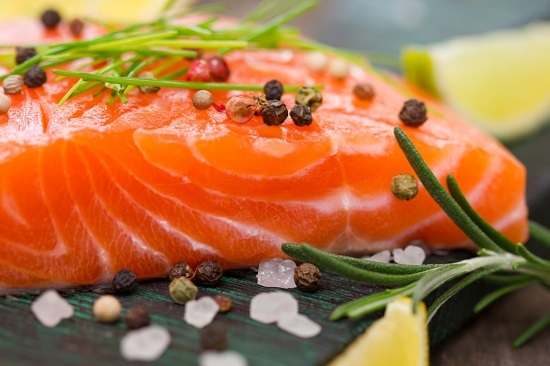 Place each piece of poached salmon on a plate. Top with strawberry sauce. 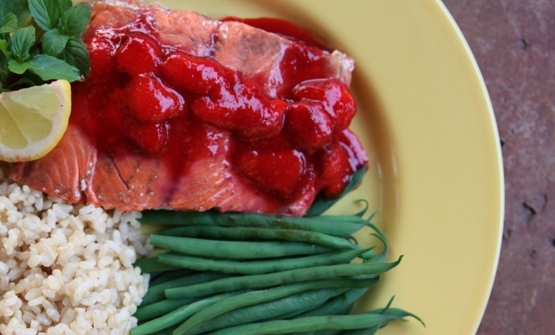 Serve strawberry sauce salmon recipe with a green vegetable. Try steamed green beans, broccoli, or spinach. Add a healthy whole grain like wild rice. Agar Agar is a sea vegetable. Great for natural thickening. Corn Starch is made from GMO corn. 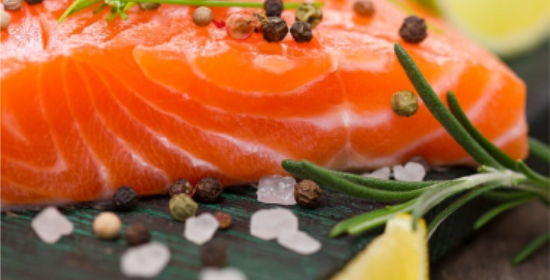 Wild-caught Alaskan salmon dwell in a natural environment of relatively clean waters and consume a natural, diverse diet, making them more nutritious and a healthier choice. *NOTE: PCB or polychlorinated biphenyls, is a known carcinogen. Metatags: Strawberry Sauce Salmon Recipe. Delicious meld of strawberries & salmon inspired by Rocky Mountain chefs. This quick, easy recipe is low calorie & so good!